My three year old will be heading back to preschool in about a month. She has unruly curly hair that is constantly falling in her face, but I hate to make her wear ponytails all the time, so her favorite hair accessory is a hair clip. I’ve made about twenty five different clips for her, and she loves to pick one that she thinks matches her outfit. She’s not always right, but hey, she’s three. I’m not into the super girly, fluffy, giant bow, corkscrew, or silk flower clips. I like simple, but for Easter this year I decided I needed to jazz up the clips just a little bit. I made my daughters matching Easter dresses (more on that next time), and I wanted to make hair clips to go with the dresses. I decided to use some fabric from the dresses to cover buttons and add one covered button to the center of each clip. They turned out really cute, and they are super simple to make. Step 1: Cut your ribbon to 4¼" long (My favorite ribbon is by American Crafts). Ribbon frays. If you are using grosgrain ribbon, you can prevent fraying by using an old trick... melt the ends in the flame of a candle! After you’ve cut the ribbon to length, quickly run both ends through the flame. It will seal the ends completely. PLEASE be careful when you do this! Only run the very ends through the flame, and do it quickly or the entire ribbon will melt. Step 2: Next, begin gluing the ribbon to your hair clip. Work quickly before the glue starts to firm up. A. First, use your fingers to pinch the clip open. 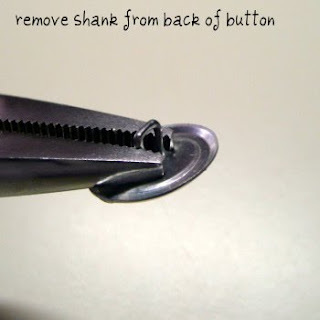 Run a bead of glue inside the clip on the underside of the top piece of the clip. Insert one end of your ribbon all the way into the clip with the wrong side of the ribbon facing the glue. Press the ribbon firmly into the glue. When cool, close the clip. B. Second, run a bead of glue along the outside of the top piece of the clip. Tightly wrap the ribbon around the point of the clip from the inside (where you just glued it) onto the glue on top of the clip. Press the ribbon firmly into the glue. C. Third, run about a ½" long bead of glue along the outside of the bottom piece of the clip at the end where you pinch the clip to open it. Tightly wrap the ribbon around into the glue and press firmly. You have now completed the basic ribbon covered hair clip. 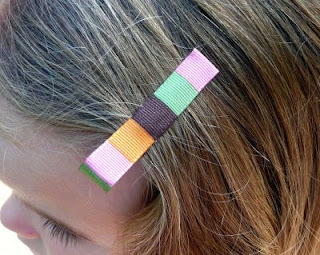 The clip can be worn just like this, or you can continue with the embellishment. Step 3: Read the directions on the back of your button kit. Most kits are very similar, and these directions will most likely apply to your kit. 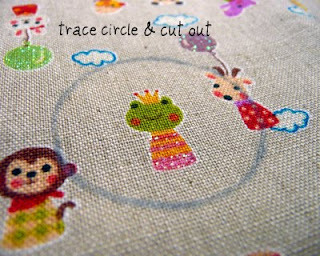 Your kit will tell you what size circle to cut from your fabric. For a size 30 (¾") button, I needed a 1½" diameter circle. Trace your circle onto your fabric, making sure to center any particular element or pattern that you want on your button, and cut it out. Step 4: Next, use a pair of pliers to remove the shank from the back of the button. Step 5: Now it’s time to cover your button. This is done by stacking layers and pressing them all together. A. Center your circle of fabric wrong side up on top of the mold that came with your kit. B. Set the button shell (the top of the button) wrong side up on top of the fabric. C. Use the pusher that came with your kit to press the button shell down into the mold on top of the fabric. D. Tuck all of the excess fabric down into the back of the button shell. E. Place the back of the button (with the shank removed) over the tucked fabric. F. Use the pusher that came with your kit to snap all layers together. Make sure you push hard enough to completely snap the back of the button into the shell. G. Your fabric covered button is complete. Step 6: Completely fill the back of the button with hot glue, and place the button on the center of your ribbon covered clip. The addition of the non-slip grip is key for little kids. My daughter has some clips that don’t have grip on them, and without fail she is handing me those clips within an hour of putting them on because they slide out. The non-slip grip remedies this problem. The grip is just non-slip shelf liner. You can buy your own roll and cut your own pieces, or you can buy some on Etsy that are pre-cut to size (I bought a pack of 50 for $3). Step 7: Cut a piece of non-slip grip about 3/8" by 1". 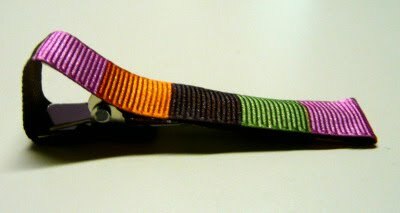 Step 8: Pinch your clip open, and run a bead of glue inside the clip along the ribbon on the underside of the top piece of the clip. Press the non-slip grip into the glue. Do this carefully so you don't get burned.. the hot glue pushes through the holes in the grip. This tutorial is extremely simple and pretty self-explanatory. Hair clips are everywhere. Please feel free to make these for personal and commercial use. 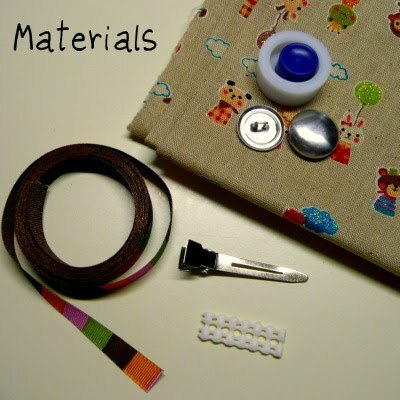 I'm linking up this tutorial over at Skip to my Lou’s “Made by You Monday”, Keeping it Simple's "Motivate Me Monday", and Today's Creative Blog's "Get Your Craft On"! Go on over and check out all of the great projects featured there. AWESOME!!! Are you sure you haven't done this before? :-) It looks amazing! I'm inspired. I actually have the same cupcake ribbon that I used to make clips too! Now I will have to make some with covered buttons! Your photos and details are amazing!! I can't wait to see what is next!! Know any good boy crafts?? Those are very cute and very creative. Great job! I'm a fan of simple, too. 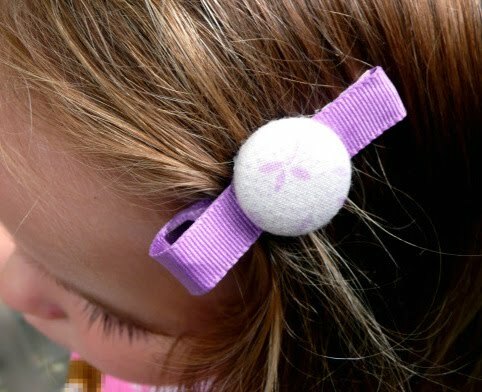 Some of the hair accessories out there are as big as the child's head! These alligator clip creations you made are sweet and just right. I'm going to have to further investigate your button covering thing-a-ma-jig. How cute is this? Hmmm...26 isn't too old for these, right? Nah! I finally - one year later - have all the supplies for this. I just don't know how you get your so professional looking. I tried with hot glue and it looks a little bumpy. I will try again! !